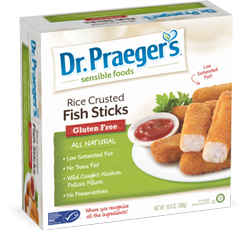 Introducing the new Gluten-Free Rice Crusted Fish line by Dr. Praeger’s Sensible Foods consisting of all natural Fish Fillets, Fish Sticks and Fishies. 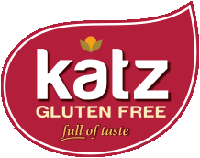 All three products are certified Gluten-Free by the Gluten Intolerance Group of North America (GIG), and are also certified Kosher. Dr. Praeger’s Sensible Foods is a family-owned company, founded by Dr. Peter Praeger, a New Jersey cardiothoracic surgeon, and his medical partner, Dr. Eric Somberg. The company is dedicated to providing a healthier line of frozen, all natural, vegetarian, vegan, kosher and gluten-free products. Simple ingredients are used and no artificial flavors, colors, junk fillers or preservatives are added. I’ve been a fan of Dr. Praeger’s Gluten-Free California Veggie Burger’s since reviewing them a while back, so I was looking forward to sampling more of their Gluten-Free products! Dr. Praeger’s switched from using a potato crust to a more crunchy rice crust for their new Gluten-Free fish line (which do not contain wheat, barley, rye, bran or oats). I was sent a box each of the Fish Sticks and Fishies (the Fishies are from their Kid’s line) to sample for the purpose of this Review. Both the Fish Sticks and Fishies were delicious! The first time I made (& enjoyed!) them for myself. Later in the week, I prepared them again for my non-Gluten-Free teens, and they also loved them. I’m always on the lookout for new Gluten-Free products that both my kids and I can enjoy (cutting down on the gluten-filled products entering my home). I’m looking forward to trying out the Rice Crusted Fish Fillets next. 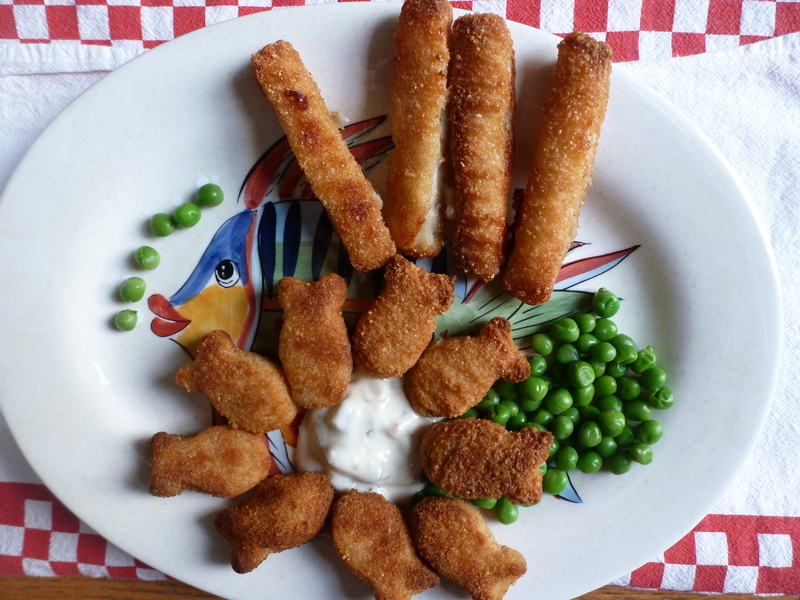 Fish Stick ingredients: Pollock fillets (wild), rice crust (rice flour, whole amaranth flour, yellow corn meal, corn starch, salt, dextrose, raisin juice concentrate, honey, expeller pressed canola oil, garlic powder, onion powder, yeast extract, spice), expeller pressed canola oil. So glad to see they are free of preservatives! Fishie Ingredients: Minced Alaskan Pollock (wild), rice crust (rice flour, whole amaranth flour, yellow corn meal, corn starch, salt, dextrose, raisin juice concentrate, honey, expeller pressed canola oil, garlic powder, onion powder, yeast extract, spice), potato flakes, potatoes, expeller pressed canola oil, salt, garlic, brown sugar, black pepper. 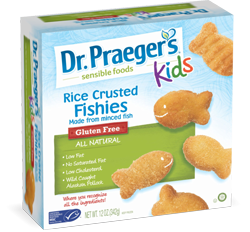 Dr. Praeger’s Gluten-Free Rice Crusted Fish Sticks sell for $5.99 a box and the Fishies are $4.99. Look for them throughout the US in the frozen section at select grocery and natural food stores such as Whole Foods, Trader Joe’s, Costco and hopefully your favorite local market. 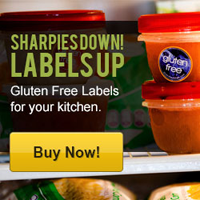 Check out the entire certified Gluten-Free line by Dr. Praeger’s Sensible Foods’ products here. Note: Dr. Praeger’s Gluten-Free products are made in a facility that also contains wheat (soy, milk, eggs & fish). However, the company is committed to keeping it’s celiac, gluten sensitive and wheat allergy consumers safe by taking steps to avoid cross-contamination during manufacturing processing. They have also taken an important safety step by having their Gluten-Free products certified by the Gluten Intolerance Group of North America (GIG). As Dr. Praeger’s also offers products made with wheat, be careful when making your GF selection. Look for the “Gluten-Free” Label, usually in red. Good to know. Thank you!!! They sound delicious, I’ll give them a try. Hopefully I can find in Shaws. Comment * Thanks for the recommendation, I think my kids will love them.